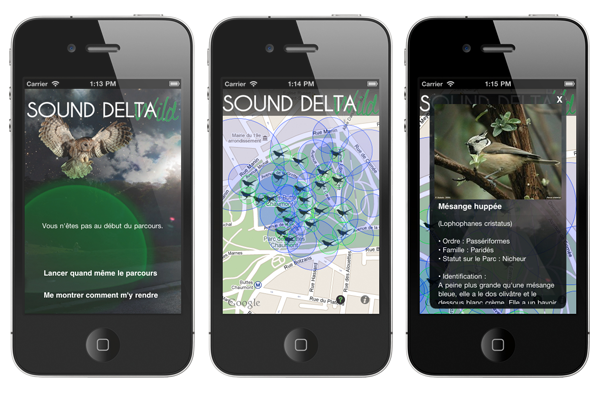 Wild is a sound device for iPhone. This immersive device is based on biodiversity sound amplification in urban spaces. Wild invites to immerge into the urban biodiversity, discovering the natural part of our environments. This scientific, pedagogic and artistic project has been inaugurated the 6th of July at Buttes Chaumont Gardens during Naturel Brut – WWF exhibition dedicated to links between Contemporary Arts and Environment. Sound composition by Rodolphe Alexis and Philip Griffiths. Wild is available on iPhone (soon : Wild for Androïd). Buttes Chaumont (Paris XIX) Naturel Brut Exhibition, – July 2010. Stay Quiet Exhibitio, MU Collective, Le Sommer Environnement Galery – Nov 2010.